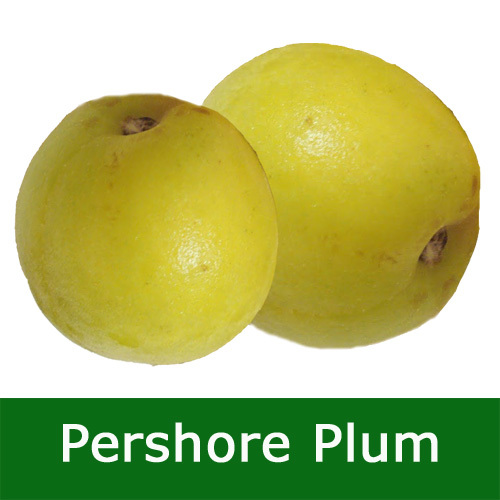 Our Yellow Pershore Plum tree can also be known as Yellow Egg plum and "has roots" in the West Midlands. A plum tree that provides a reliable crop that is ideal for cooking and possibly eating. Although the Pershore Plum is listed as an eating plum, it is not as juicy as other plums. Cooking the Pershore Plum into a puree makes it ideal for jam or fillings and the fruits can be frozen. Good resistance to plum diseases will offer peace of mind when purchasing and the blossom has some frost resistance qualities (incase you accidentally put in in the freezer!). These are just two if the reasons why Pershore or Yellow Egg Plum are grown commercially. If you plan on storing the fruit then pick just before it is ripe and it will store for several weeks. Pershore Yellow Plum trees were apparently found by chance in 1822 growing in Tiddesley Woods near Penshore, Worcestershire. We don't think this means someone called Chance found a plum tree in a large group of trees by accident shortly after 6.20pm. This plum is in flowering period C2 in case you have a non self-fertile plum tree that requires a pollination partner nearby. Pershore Plum will pollinate any other plum tree in flowering periods C1, C2 and C3. This variety of plum tree is supplied in a 12 litre container, which means that the tree can be planted any time of the year and with better results than either bare-root or rootballed trees. Lesser final heights can also be obtained by reducing container size or pruning.